Affectionately known to locals as 'The Magic Skagit' the watershed is a place of extraordinary scenic beauty, both natural and cultural. According to the author Tom Robbins, it is where wild nature, art and agriculture commingle in an unprecedented mix. 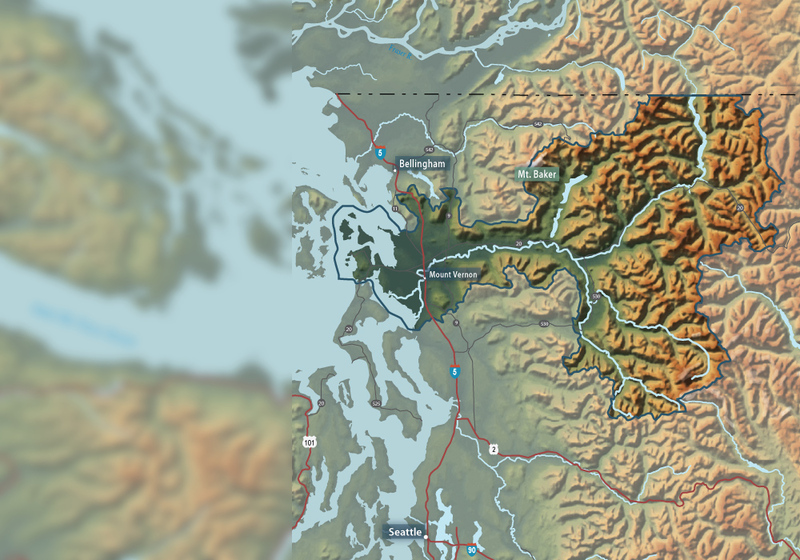 Home to the largest river in Puget Sound, the watershed is an essentially agrarian place, its signature look represented by rugged mountain peaks, forests and sweeping vistas of cultivated crops. 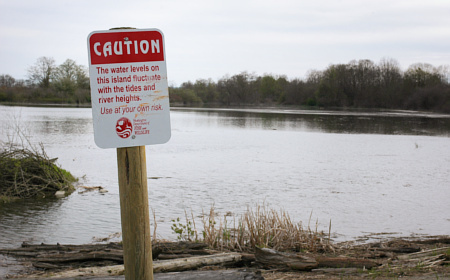 The many rivers, streams and wetlands shelter chinook, coho, sockeye, chum and pink salmon, and the agricultural fields host many migratory bird species over the winter. 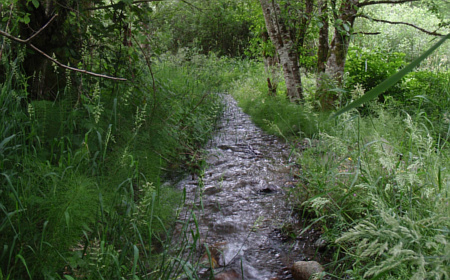 For more information visit the Skagit Watershed Council's website. 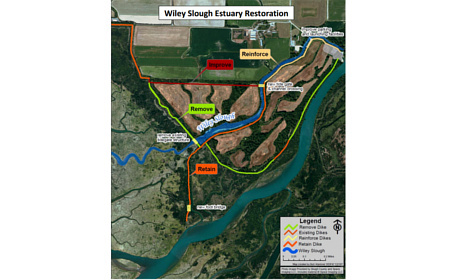 Estuary habitat was restored at the Wiley Slough Restoration Site by removing dikes to allow tide waters to flow over the site and restore natural processes to the tidal marsh. Construction included the removal of dikes, creation of new dikes, and the installation of infrastructure to maintain agricultural drainage. 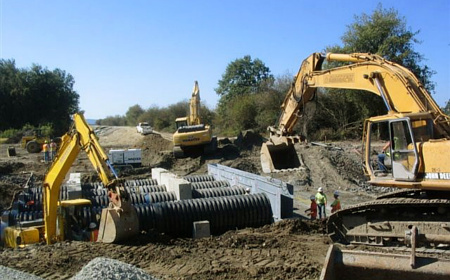 In this photo the crew is installing a new tidegate to allow the drainage of adjacent farm land. When the dikes were removed the site was immediately flooded with the tide. 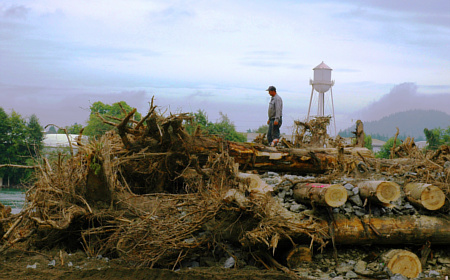 When they were exposed to salt water many trees along the former dike footprint died. These 'snags' are now used by raptors and birds for perching and roosting. 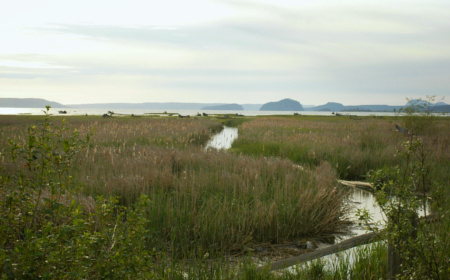 New tide channels or 'blind sloughs' provide young Chinook areas to feed and seek refuge while transitioning to their salt water phase. 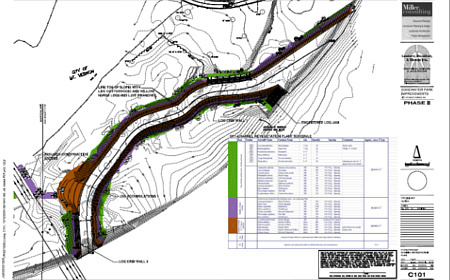 The design of the Edgewater Slough Project including a list of native plants to be planted on the site. Initial Construction started in May 2005. The main channel was mainly constructed 'in the dry', and kept isolated from the Skagit River in the spring while fish were migrating upstream to spawn and downstream to the ocean. 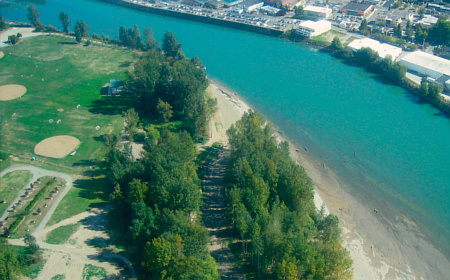 In the summer of 2005 an artificial logjam was constructed at the mouth of the Slough to direct a portion of the River into the channel. Most of the logjam is buried in the bank of the river mimicking natural logjams. 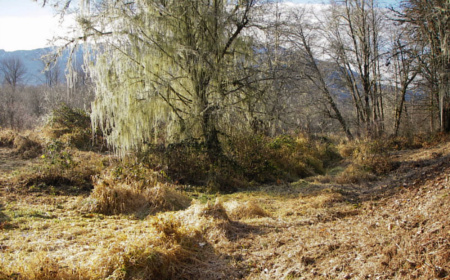 The finished channel is dry during times of low river flow but will fill up to provide habitat during the spring when young fish are seeking habitat to rear and prepare to migrate to the ocean. 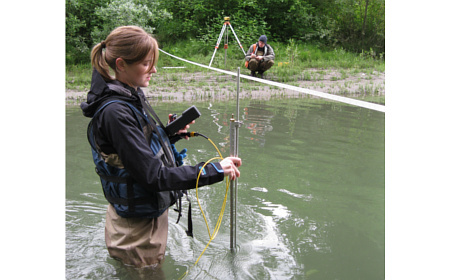 To evaluate effectiveness of the restoration, technicians monitor the habitat conditions in the new channel. 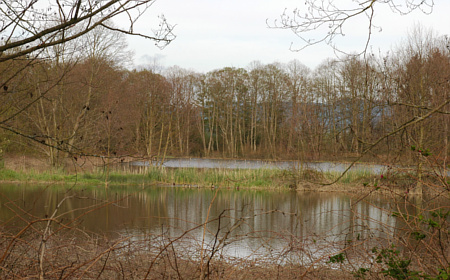 The plan is to relocate the stream to its former channel thereby creating a backwater area for spawning and rearing. 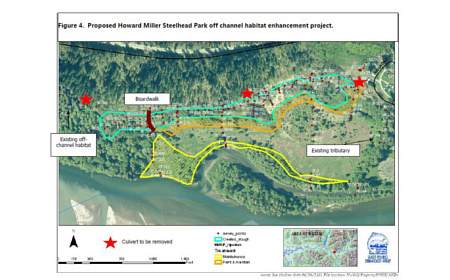 Access to off-channel habitat is important for young Chinook salmon allowing them to escape predators, avoid high river flows, and to feed & grow to prepare them for their marine life phase. 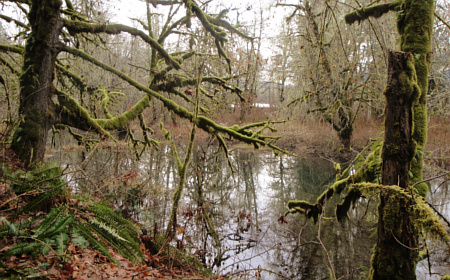 Areas that have existed for decades as grass meadows will be restored to open water habitats accessible to young salmon. 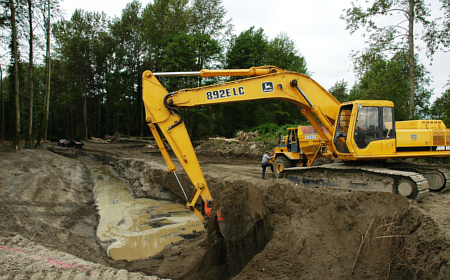 Spawning habitat for Coho salmon and Steelhead is re-opened by removing a culvert that used to block the fish. 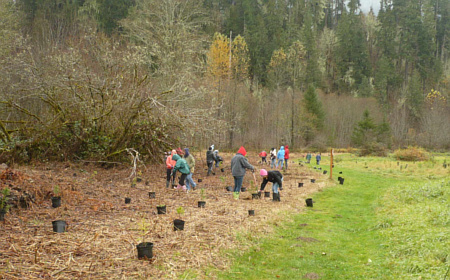 Volunteers are used to plant native trees and shrubs on the project site. The habitat is improved and the volunteers take home a rewarding experience.